This image, “3-Dimensional atomistic construction of nanoporous gold,” was prepared by Bin Ding, a graduate student in the lab of Asst. Prof. Niaz Abdolrahim. Nanoporous metals – arranged in networks of interconnected pores and ligaments a few nanometers to several microns in size -- are excellent candidates for a variety of high-tech applications, such as catalysts for fuel cells, air and gas filters, biosensors and actuators. The open cell structure and the high surface-to-volume ratio of these networks make them particularly conducive to catalytic activity and to heat dissipation. The challenge is designing nanoporous metal networks that can withstand the various deformations, or strains, they will be subjected to without cracking or fracturing. Niaz Abdolrahim, assistant professor of mechanical engineering, has been awarded -- on her first try -- a $350,000 grant from the National Science Foundation in pursuit of that goal. The funding will enable her and two PhD students to use computer simulations to develop predictive models and deformation maps that will guide the creation of nanoporous metals with enhanced ductility (pliability) and strength. However, these experiments have been unable to replicate the nanosecond/nanometer scales at which the deformations occur. So her long-term goal is to “bridge the gap” between experimental and computational investigations, resulting in reliable and accurate predictive models for analysis and design of nanoporous metals. Niaz and her students will focus primarily on nanoporous gold. 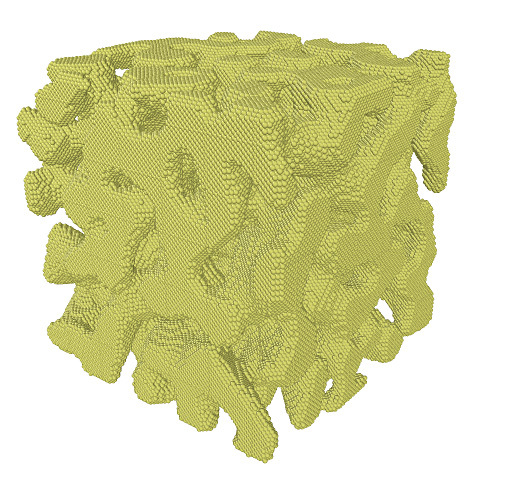 They will use atomic-level simulations to understand the underlying mechanisms that control plastic deformation in this material, and how the affects of deformation vary depending on various parameters, such as different configurations and sizes of pores and ligaments and different loading directions. These findings will be integrated into deformation maps and mathematical models that can be used to predict which configurations result in the greatest ductility and strength. Those predictions, in turn, will be compared to available experimental data.